SourceGear's Eric Sink came back from SD West 2007 with some extra T-shirts. SourceGear, in case you didn't know, makes tools for professional software developers, and founder Eric Sink is a prolific writer on the subject of software development and the business of software. His blog posts and other writings have earned him a reputation as a guy worth listening to; IMO his stuff is required reading for anyone in the software business. Back to the T-shirts. At SD West 2007, the deal was you had to agree to wear it around the conference to get one. Rather than letting the extras sit around in a box in the back of the office, Eric's now making them available to anyone who asks and agrees to post a photo of themself wearing it (plus a couple of other requirements - read his blog post for details). This sounded like fun, and hey, you can't have too many geek T-shirts, can you? 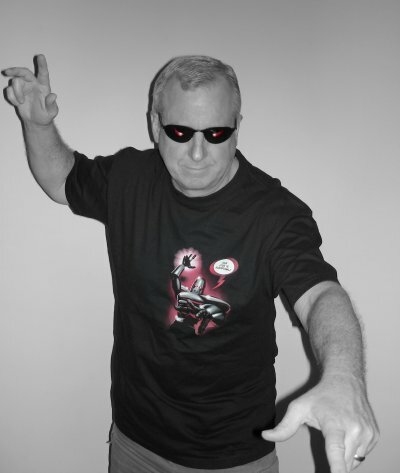 So thanks, Eric, for the 'Evil Mastermind' shirt. Here's my photo; as you can see, I had a little fun with it, too. The full-size image is on Flickr. (Click the shirt to make it speak). Side note for anybody who's going to Southwest Fox 2007 in Phoenix in October: Keep your eyes open for me wearing this shirt. The first person who comes up to me there and tells me they saw this picture on my blog earns a frosty-cold beverage of their choice. ListPro, a terrific little tool for creating and managing lists of all kinds, is featured on Bits du Jour today for only $4.95 against its regular price of $19.95. I've used ListPro for several years and have found it to be useful for all kinds of personal and work-related lists. 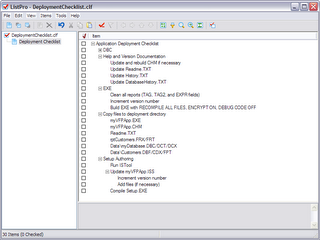 For example, the screenshot is a sample software deployment checklist I demo'd at a recent conference presentation. Items in a list can be arranged into groups in a hierarchy, and groups can be expanded or folded up for ease of use. List items can also be easily moved around to alter their sequence and relative position in the hierarchy. This screenshot shows only two of the several columns that can be associated with each item in a list. I also use ListPro to maintain my pre-conference packing and checklist when preparing to leave on a trip. As with all items on Bits du Jour, this is a one-day price. ListPro is available for Windows PCs as well as for handheld and other mobile devices.